I know that Brunei doesn’t really cross people’s minds when they think of diving spots. Even for those living in or planning to visit the Southeast Asia region, there is already a plethora of notable (diving) destinations to choose from such as Bali in Indonesia; Sipadan, Langkawi Island and Tioman Island in Malaysia, Boracay or Palawan for the Philippines and Koh Samui or Phuket in Thailand, to name a few. With its geographical size of 5,765km2 and a population of about 400,000, one can easily be forgiven for not thinking of Brunei at all given its relatively quaint and quiet stature on the world stage. Brunei Darussalam, as it is officially known, sits on the northern coast of Borneo Island and is sandwiched between the Malaysian states of Sabah and Sarawak. Brunei regained its independence in 1984 and maintains close relations with its protectorate powers, Great Britain. Those who have heard of or (think they) know about Brunei would usually throw out “Sultan of Brunei”, “rich country”, “oil and gas”, “Sharia Law”, “no alcohol” or “no night life.” As a Bruneian citizen born to Bruneian parents, who has also spent half her life growing up in the “West” (Philippines, UK, US and Canada), I believe that I can help balance out the facts and perception. One thing I can also promise is that Brunei is a hidden gem and houses many treasures not usually on the typical tourists’ list of things to do and see. The dive scene alone is gaining considerable traction, as evidenced by sprouting dive clubs and the young and hip looking to the water for some activity. WHY SHOULD I DIVE IN BRUNEI? Brunei is home to a diverse underwater landscape off each district’s coast (Brunei is divided into 4 districts but people usually dive off Brunei-Muara, Tutong and Belait district), though mainly famous for wreck and macro diving. There are a number of sunken World War II ships, a decommissioned oil rig and reefs ranging anywhere between 10 to over 30 meters from surface to reach. Pelong Rock and Two Fathom Rock are the usual choice for shallow water dives or snorkeling as waters close to the formation offer depths of around 5 meters and have great visibility. For a small country and a short coastline, there’s a buffet of dive sites to choose from and divers are active in the search for new places in the ocean so the list is growing. Brunei’s ocean coastline is dotted with many diving sites, including relics from World War II, reef patches that even rival that of the Great Barrier Reef and a lively marine life. Brunei’s diving and tourism scene are basically in their early stages, though intentionally so as the country is interested in retaining its blue skies, lush jungles and clean water. There are sites that are visible victims of irresponsible fishing methods (unclaimed nets and use of fish bombs) but there are increasing measures from both authorities and home-grown NGOs to prevent further damage. Most of the dives sites carry a healthy fish population otherwise and the increasing conservation efforts to maintain Brunei’s underwater wildlife and waterway cleanliness are making good headway. Brunei has yet to develop a thorough travel network. There is no under or above ground train system and the bus routes and related information are limited. Everyone in Brunei owns a car or two to get from one place to the other but the low population and tourist traffic numbers allows for the country to remain relatively pollution-free. The dive sites are never crowded and there is still plenty more being explored in terms of new places to dive. As such, divers are spoiled for choice and therefore spread around the ocean. The country’s surrounding infrastructure is quite developed though you will have to rely on established dive centers or the goodness of the accommodation host to get you around. You will basically be surrounded with peace, quiet and an array of beautiful underwater scenery – all things that are now a luxury for most dive destinations around the world. The dive sites are less than an hour’s boat drive away off the Brunei-Muara coast so diving requires boat entry and short bottom times. Be prepared for an early morning start to spend half a day on the boat and enjoy meals in between dives. Brunei has an equatorial climate which means that it is mainly hot and has its rainy seasons, but its weather conditions tend to fluctuate. On good days, expect flat ocean surfaces and visibility well over 20m from the top to view the breathtaking reefs and world class wrecks at the bottom. On not-so-good days, you could experience huge swells, swift currents and minimal visibility. No two dive days are the same, to say the least. Couple the weather/dive conditions with what’s down on the ocean bed (wrecks, reefs and sunken infrastructure), your diving skills will basically be put to the test. Brunei divers tend to be good navigators, boat drivers and even fishermen, as such. You will basically get to learn from and with some of the best mermaids and mermen around the world. DO I NEED TO BE CERTIFIED TO DIVE IN BRUNEI? Dive centres and instructors in Brunei are PADI certified for scuba diving. They would expect you to have basic open water certification to go into the ocean. Because the wrecks are usually beyond the 18m open water mark, it would also be good to be certified advanced and have wreck diving experience, which is a specialty in scuba diving. HSSE is taken very seriously by all dive operators I’ve dived with. There are a number of day trips that can also be arranged for those interested in snorkelling or just want to “test the waters” in diving (no pun intended). Free divers will be expected to have another free diver accompany them (buddy system) or a dive master in the vicinity. The freediving scene is quite new in Brunei with its members picking up the activity by practice or getting certified abroad (like me). Whatever it is, the major rule of thumb remains: never dive alone. CAN I GET CERTIFIED IN BRUNEI? Yes you can for scuba diving. The two dive centres, Poni Divers and Oceanic Quest offer a variety of PADI courses from discovery (introductory) diving all the way to PADI Professional Divemaster. Some of the independent dive operators are certified to a level that they can teach and certify scuba divers. Keep reading this post for more info. For freediving, you will have to rely on visiting freediving instructors usually brought in by Poni Divers, such as the case with me and Stefano. If you have a couple of weekends to spare and meet the minimal requirements within that time period, you should be able to be certified up to AIDA Level 2 and confident enough to freedive in Brunei waters. WHO CAN I DIVE WITH? There are surprisingly quite a number of dive establishments and (independent) operators in Brunei againsts its population and market size. Poni is arguably the most active dive centre in Brunei with its base operations and club membership growing to over 500 people to-date. It was established in 2010 by local Wong Thye Sing who spent some time abroad before setting up the centre. I would often bump into him several times around my college years in Canada (the saying “Brunei is small” also refers to social degree of separation). Poni is a one-stop shop for all things diving and water activities such as banana boat, jet skiing and parasailing. Poni is basically looked to for diving courses, training, tours, corporate activities, public-private partnership projects and marine conservation awareness initiatives. It has basically spawned into a local brand for the diving scene in Brunei. They have their own website and are active on Facebook (/Poni Divers) and Instagram (@ponidivers) which is regularly updated with package deals and upcoming activities. Established in 2009 by Malaysian Steven Ng, Oceanic Quest is the pioneer dive centre in Brunei. Steven initially sought out to capture Brunei’s dive sites through photography and later on established the centre. Oceanic Quest appeals to serious divers and underwater photographers, and is purposeful with their “slower” dive traffic as they are very big on ensuring the sanctity of the ocean environment. They also do regular trips abroad from Brunei and are very transparent with their pricing and facilities. Oceanic also houses a dive equipment shop and upstairs lodging. Their showroom is well equipped with the latest diving gear needs from regulators to BCDs, fins, rash guards and snorkels. I got my first diving mask and snorkel there. Check out Oceanic Quest’s website and Facebook (/oceanic.quest) for more details on their diving packages. The Universe introduced me to Lantaran Divers when I was taking a drive around town. I happened to pass by a highly conspicuous truck that housed stickers and contact information related to diving so I took mental note of the details. I asked my other dive buddies and Lantaran seems to be a well-known operator so I requested for a sit-down with the owner. Lantaran Divers was established by Rosland Haji Suhaili in 2008 as a family business. Rosland, who owns his own boat, works on a request basis with a minimum requirement of 4 divers and overseen by at least 6 crew members at a time. Scheduling is therefore quite flexible and so are the selected dive locations. Lantaran is a forerunner in overnight camping and island picnic trips to Pelumpong Island, originally a spit that was artificially cut to provide access to Muara Port and is frequented by the general public for recreational activities. I found Lantaran’s original blog here. More information can be obtained by contacting Rosland himself at (country code: 673) 880 1960. You can also follow his Instagram @lantaran_divers_brunei. Cekli (real name Noor Azlin Adnan) is a Malaysian who has spent well over 20 years in Brunei as an instructor at a local technical institution. Teaching scuba diving and taking out people for recreational dives has been a past time of Cekli since getting fully certified in 1993. He is a PADI Master Scuba Diver Trainer (MSDT) and can teach over 9 specialties. 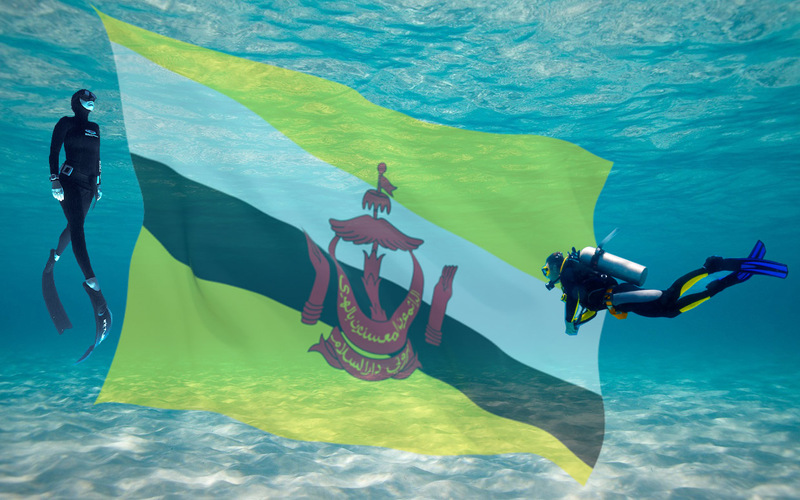 He has certified over 2,000 scuba divers to-date, a handful of whom now run their own or work in dive operations in Brunei today. I got my PADI Open Water certification under his guidance and continue to dive with the Cekli Dive Crew every now and then. You’ll often find Cekli at sea with the usual members or student divers on weekends and public holidays when he’s not busy educating the young masses at his full-time job. His doors are always welcome to friends, family and divers alike. You’ll find his home bustling with guests after hours to sit their dive theory course or simply just hanging around this father figure. You can follow Cekli on his Facebook (Noor Azli Adnan) or text/call/Whatsapp him at (673) 882 2459. Kimmy managed to carve a name for herself thanks to her pleasant disposition and passion for life. She has been a full-time dive operator since 2014 after previously spending many years juggling her life in the corporate world and teaching scuba on the weekends. Kimmy is a PADI Master Scuba Diver Trainer (MSDT) which means she can certify students to the highest recreational level in the PADI system of diver education. She gets a mixed bag of interest from within and outside Brunei who either want to get trained towards certification or do recreational dives. The good business relationship she has with the boat master allows for Kimmy to entertain a flexible diving schedule, provided there is a minimum of 2 scuba divers at a time. For those who want to train with her, she will work around your schedule. She has a complete scuba diving gear inventory so you will be charged reasonably based on whether you’ll need to rent out scuba gear or not. Her hospitable nature is understated. Whilst she does not run lodging services, Kimmy is happy to entertain aspiring and visiting divers from all walks of life. She can be reached via phone number (673) 880 1212. I came across Dive Tribe Borneo by a friend who mentioned the name in passing. I found their website by checking on the search engine but there is no phone number for me to contact. The website itself is quite informative and vibrant, particularly on the different dive sites in Brunei. I could be assuming but it looks like it’s catered more for the locals as they offer scuba diving training, scuba gear service and maintenance, swimming training and some island picnic trips. There is a reservation form section available, though I suspect the arrangement is purely on diving as it does not ask where you’re staying or offer travel arrangements. My request for interview through their contact form has not been entertained, so I’m not sure on whether it’s still active. WHERE CAN I STAY WHILE I DO A DIVE TRIP TO BRUNEI? Poni Divers and Oceanic Quest offer reasonable food and lodging dive packages for visiting divers. Poni Divers is located by Serasa Beach. Their home stay accommodation is 5 minutes away from the dive center and neighbors local cafes and convenience shops. Daily transfers between the lodging and dive center are complimentary. Oceanic Quest centre and attached lodging is located in Muara town, a short few minutes’ drive to the nearby Serasa and Muara beaches. For those who intend to dive with the independent operators, you will have to rely on the goodness of your dive host or accommodation place for travel arrangements. HOW DO I GET TO BRUNEI? Brunei is accessible by air, land and sea transport. The ferry terminal at Muara services regular connections Labuan (Malaysia). By road, Brunei is accessible on its well-developed highway networks by land from Sabah and Sarawak, the east Malaysian states that borders the country. You will need considerable planning and research to get to your end point in Brunei if you’re coming by land and sea. Brunei International Airport is the main entry point to the country. There are more code share flights betwen Brunei and other destinations being resumed through RB but these are seasonal at best. Other air carriers that come to Brunei regularly are Singapore Airlines (to and from Singapore), Malaysia Airlines (to and from Kuala Lumpur) and Air Asia (to and from Kuala Lumpur). It takes about 2-3 hours by air if travelling between Brunei and most of the major Southeast Asian hubs such as Kuala Lumpur, Singapore, Bangkok and Manila. HOW MUCH DOES IT COST TO DIVE IN BRUNEI? Diving in Brunei is a relatively affordable activity by local standards. It offers the chance to do something seemingly exotic and adventurous while travelling no more than an average of 15-20minutes to the nearest dive centre or beach where the operator will meet you. For certification courses, the dive centres (Poni Divers and Oceanic Quest) offer a slight premium compared to other places I’ve seen around the region, but there are always discounts and promotions on offer, particularly for the locals. Those interested to get certified in freediving are subject to seasonal fees or packages agreed upon by the centre and the visiting instructor. For those in Brunei wanting to get certified and direct more of their cash on future fun dives (i.e. save some money), I would recommend going with the local dive instructors to learn. Their operational costs are minimal as you will only be paying for the course materials and certification fees. The pricing for fun/recreational dives vary across the dive centres and independent operators in Brunei. Expect to pay a minimum of BND50 (approximately USD37) for 2 fun scuba dives (equipment included). Again, locals will enjoy discounts. Freedivers wanting to go for fun typically have their own equipment so will end up paying no more than BND30-35 (USD22-25) for two dives. WHEN IS THE BEST TIME TO DIVE IN BRUNEI? Brunei’s coastline faces the exposed South China Sea, therefore subject to the weather conditions and trail effects from nearby countries. The best time to dive in Brunei is reported to be between March to November when seas are calmer and visibility more promising. Weather temperature is extremely hot at 24 to 36 degree Celsius. The wet or rainy season usually occurs between October to February and May to June and humidity level tends to remain the same all year round. The water temperature tends to stay at 25-30 degrees Celsius. When there is thermocline below surface, it is not all that extreme. In the off-season months when there are still divers braving the waters, huge swells and visibility leave much to be desired. Water temperature remains relatively the same otherwise. Again, if you can dive in Brunei waters, you will pretty much learn a lot. While Brunei water temperature doesn’t get that extreme, it would be good to wear a thin wet suit or rash guard regardless for protection against the elements and water borne irritants such as jellyfish stings or sea lice bites. The dive centers maybe have a good ration of equipment on standby, though it’s not usually the case for dive clothing so best to bring your own if you’re travelling to Brunei. The dive centres and independent operators are quite well-stocked when it comes to scuba diving equipment. For freediving, it’s best to bring or acquire your own kit (wetsuit, fins, socks, low-volume mask and snorkel). WHAT ELSE IS THERE TO DO IN BRUNEI? Often cited must-dos during a visit to Brunei include a river tour of Kampong Ayer (the water village, often branded as “Venice of the East”), the Omar Ali Saifuddien Mosque, ride some thrills at the recently refurbished Jerudong Park Playground, take pictures at the front of the Istana Nurul Iman (His Majesty the Sultan of Brunei’s official residence), stay at the five-star Empire Hotel and Country Club and do a tour of the Ulu Temburong National Park which is in the heavily untouched rain forest district of Temburong.